"The Hired Hand" is an exciting western set in New Mexico in 1880, which Peter Fonda both stars and directs. After their young friend, Dan, is brutally murdered, Collings (Peter Fonda) and his travelling companion of seven years, Harris (Warren Oates), return home to the wife and child that Collings abandoned. And when the love between man and wife is rekindled, Harris decides it is time for him to move on. However, shortly afterwards, Collings learns that Harris is being held captive by Dan's murderer; and feels compelled to got to his rescue... the outcome is a bloody gun battle from which only one man survives. � Universal Pictures and The Pando Company, Inc.
Official Run Time: 87 mins. 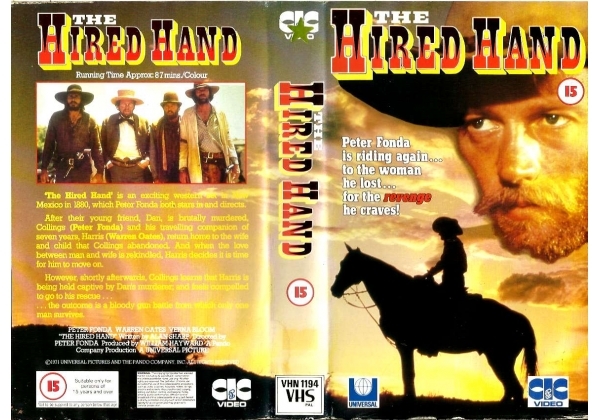 Or find "Hired Hand,The" on VHS and DVD / BluRay at Amazon.